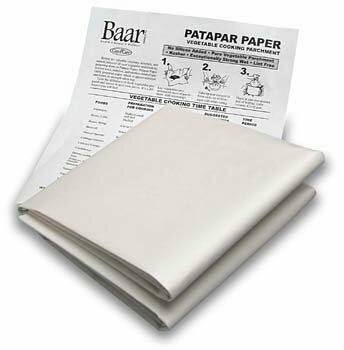 Retain the valuable vitamins, minerals and natural juices of all your vegetables and food by preparing them in Patapar® Paper. This non-toxic, tasteless, odorless sheet of specially prepared paper is grease-resistant and keeps its strength when wet and is lint free. Kosher Product: Rated K. Taste the difference of fresh vegetables prepared and served in their own juices. 6 reusable, durable sheets (24 x 24 inches). Can wet to conform to shapes and molds. Can be frozen and then heated without cracking. Patapar® is a Trademark of Baar Products. If you have any questions about this product by Baar, contact us by completing and submitting the form below. If you are looking for a specif part number, please include it with your message.